Topic: Bill in "Broken Flowers"
Topic: Films like LIT? Are there any? Hoorah!! My clip upload to the LIT board worked! Topic: Has anyone here had a relationship like that? Besides Letterman tonight and Conan on Dec 24, Jane Pauley has a guest visit from Bill on Weds, Dec 22 to discuss TLA and a certain vist from a young SNLer who stole donuts from her morning show . The Jane Pauley Show is on NBC at 4 PM MST...check your listings for your area! Topic: Scarlett on late night TV?.. I remember it was at a Japanese site, but the order form was in Japanese. I'm thinking it was the Japanes LIT site where I saw it - check it out. 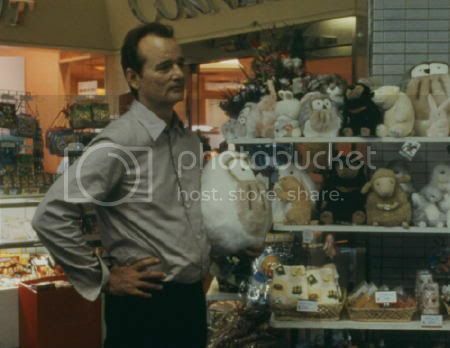 Topic: Lost in Translation Sequel?